Comparing Lubbock to the Barnett Shale | Texland Petroleum, L.P. In any oil and gas development, the name of the game is extracting fluids stored in a rock formation. 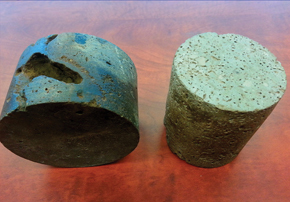 The key has historically been finding layers of rock and sand that have a high porosity – think of rocks filled with holes, like a sponge; and a high permeability – the measure of ease with which fluid can move through a particular rock. In Lubbock County, production comes almost exclusively from the Clear Fork Formation, which is a dolomite rock layer lying approximately 5,300 feet below the surface. The formation has been developed for decades using hydraulic fracturing. The Clear Fork is a “conventional” reservoir—that is, it is a porous and permeable rock that has produced millions of barrels of oil. By comparison, the Barnett Shale around Fort Worth holds incredible volumes of natural gas, but does not have the typical porosity and permeability that one would find in a conventional reservoir. These “unconventional” or “resource” plays have been made possible by new horizontal drilling and hydraulic fracturing techniques. At left, you can see core samples from the Permian Basin. Note the abundance of naturally occurring holes and cracks in the rock allowing for the movement of fluid. 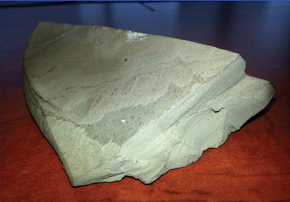 The rock can be cracked easily with minimal amounts of water. Compare this to a sample from an oil shale at right that has no visible natural pathway for fluids or gas to travel through. Pathways are created in shales by force with millions of gallons of water.